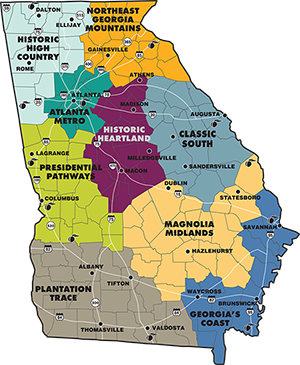 The following Calendar of Events listings have been provided by event venues, individual organizers and readers of Georgia Magazine. Event details and costs are subject to change; please verify before attending. 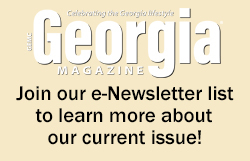 Looking for the events printed in this month's issue of Georgia Magazine? Click here. Regions are determined by the Georgia Department of Economic Development. See its online calendar at exploregeorgia.org for additional events. Have an event you'd like to post? Click on the Post Community Event button below. Have an event you'd like to run in our print Calendar? We’re currently compiling Calendar listings for our July 2019 print edition. Listings are due by April 15, 2019. Email calendar@georgiaemc.com with your event information. For more details, visit our Contact Us section. Griffin Area Concert Association presents the explosive classic ensemble Frisson Ensemble in concert. This six piece ensemble entertains with various combinations of strings and winds. Their program includes classical works by Beethoven, Mozart, a traditional Celtic suite and Ennio Morricone's Gabriel's Oboe. A truly new presentation of classical music. Enjoy exotic flavors in a mobile vending setting with amazing cuisine at Duluth's Fridays-N-Duluth! Fridays-N-Duluth will take place every Friday 6-9 pm from May to August. There will be live music on the Festival Center Stage and in Parsons Alley. Enjoy a night filled with fun, food trucks, entertainment and more. 5:00 – 7:00 p.m. Bluegrass artists, Jeanette and Johnny Williams Band will be performing this year! Gates will open at 3:00 p.m., where outbuildings will be open for viewing. Concert starts at 5:00 p.m. Please bring your own chair. Food will be available for purchase. This is a rain or shine event. All proceeds go to Friends of Hardman Farm. Check our website or Facebook for details. Tickets are $27 adults and $19 17 and under and can be purchased online. 10:00 a.m. -3:00 p.m. Over the years, Hardman Farm has been the home to several species of livestock. Come visit and pet some furry friends here on the Farm as we continue our journey to "bring the farm to life" and keep the American agricultural experience alive. Pricing: Animal encounters are free with site admission. Your site admission also includes a tour of the Big House and Farm. Bluegrass, Country and Folk music every month at the Ringgold Depot. Join the Master Gardener Volunteers of Cobb County as we celebrate our 17th Annual Garden Tour! We have six gardens to view this year, with four private home gardens, one working daylily farm, and one Master Gardener project, the Center for Children and Young Adults. Children 17 and under are free! Tickets are $15 in advance and $20 the day of the Tour. We will be there, rain or shine! Fast Track 5K Join the Southeastern Railway Museum and the City of Duluth for the fifth annual Fast Track 5K in downtown Duluth! The fun begins at 8:30 am at the Red Clay Music Foundry on May 11. The race is a PEACHTREE QUALIFIER and will have CHIP TIMING! All proceeds of the race will benefit the education and equipment restoration and conservation programs of the Museum.